Laminate flooring offers some advantages over hardwood flooring, but that doesn’t mean it is the right choice for you. First, the visuals. 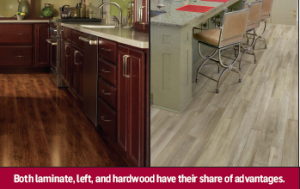 Can you tell the difference between a hardwood and laminate floor? When you look at a laminate floor you will see the pattern repeat itself, where-as on a real wood floor these marks would be totally random. The frequency of the pattern that is printed onto laminate flooring can be repeated every third or fourth board, but in some cases all boards are identical in appearance. The other sign of a hardwood floor is it dents more easily and generally doesn’t stand up to heavy traffic, unlike laminate flooring. If you prefer the character of hardwood that develops with time, and your budget will allow, hardwood may be the better option. A hardwood floor generally costs 20% to 25% more than an identical laminate floor. Laminate flooring is a highly durable product, but if it gets scratched or worn, then it cannot be re-finished like solid hardwood flooring, which can simply be sanded down and re-finished like new. However, laminate flooring withstands heavy traffic from normal family life, and is easy to install and care for. The choice between laminate flooring and real wood flooring can depend on a few different situations. The location of your property and its current style can determine your choice. Does the current value of your property warrant the expense of high-end hardwood flooring? If you are looking to increase the resale value of your property? Then you need to consider the investment value of your new floor, and the amount by which it may increase the value of your property. Do you plan on staying in your current property for a while to make full use of your floor, or are you looking to sell the property in the near future. If you have a budget, then it may be better to install good quality laminate flooring than lesser quality hardwood flooring. Laminate flooring offers some durability advantages vs. hardwood flooring. Ask yourself what type of traffic and abuse your new floor will have to withstand. Some laminate flooring is available in water resistant and waterproof ranges and can therefore be installed in bathrooms. Hardwood would be much more unstable in this kind of environment because of the humidity levels. Laminate flooring usually comes with a 10- to 15-year warranty against staining and fading from sunlight. Most laminate flooring can withstand household accidents such as cigarette burns, bleach spills, etc. floor. Unlike hardwood floors, laminate flooring doesn’t need re-sanding or refinishing. However, this can be to its disadvantage over a period of time as the laminate flooring could eventually need replacing, whereas the solid hardwood floor could be sanded down and refinished like new once again, but it is a major disruption for you and your family. Replacing a laminate, on the other hand is a relatively simple—and clean—process. Get the Absolute lowest price! Information and News on All types of floor coverings including laminate flooring, hardwood flooring, carpet flooring, ceramic tiles, vinyl flooring, bamboo flooring, cork flooring.